I’ve been fishing with the SteelShad blade baits for almost a year, but I’ve gotten very confident with it in the past 4 months. In fact I’ve reached a point where it’s hard for me to put it down. This past weekend at Cayuga Lake was no exception to that. After struggling for a few hours we finally located some fish midlake. By some I mean close to 40. Now, by no means am I saying we caught 40 big ones. In fact we had to weed through about 35 little ones to get the 5 good ones. But the later we stayed the better the fishing got. This was my first time ripping a SteelShad through the grass, but I gotta say that I was really impressed with it. And maybe my learning curve with it had something to do with the bigger bites coming later in the day. It’s not like cranking, and it’s just like cranking. 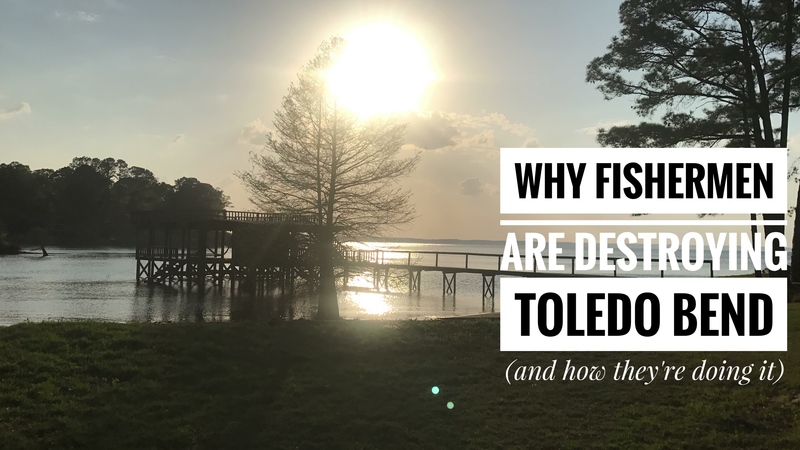 The biggest difference is that the bait is sinking all the time, and when it got in the grass it was a lot easier to pull out than a crankbait. Whenever you’re ripping baits through deep grass the key is always coming out clean. When you do that it almost always generates a strike. When I’m deep cranking at Cayuga my success rate is about 5:1 (of every 5 casts I’ll rip it through clean once). But I was able to pull the blade bait through nearly every time. Part of that is definitely do to the set up I was using. 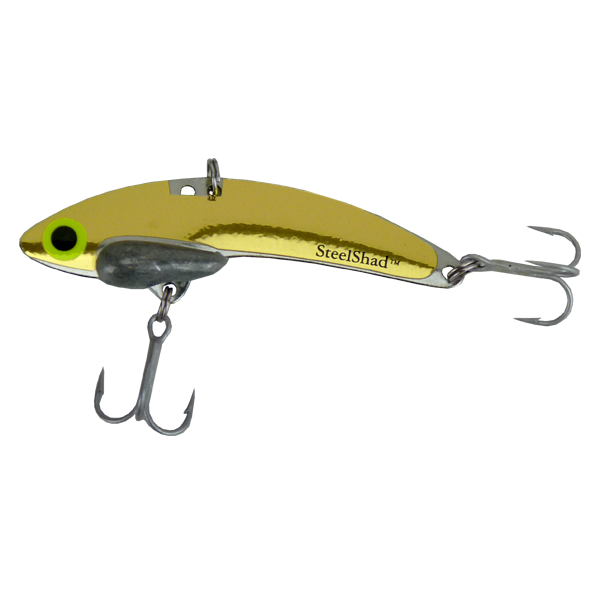 The Wright McGill Double Trigger Rod was perfect for the SteelShad in this application. 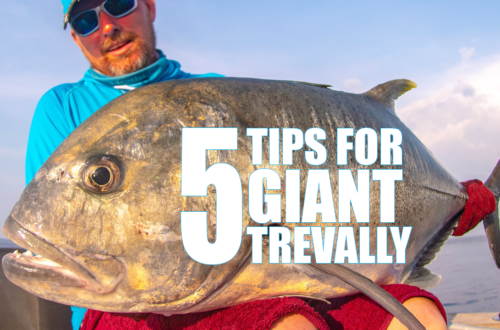 It has just enough backbone to rip that bait free without having to sacrifice casting distance or give in the hookset. I didn’t know ahead of time how this rod was going to perform in this application, but I can tell you that I was thoroughly impressed. So much so that I won’t look for any other rod to do this with in the near future. The best part was how hard the fish were attacking this bait. There were no soft bites. Every one of them knocked slack in the line and/or tried to rip the rod out of your hands. We caught fish on both the silver and gold, but the gold seemed to get the bigger fish more often than the silver. None of the fish shook off the bait. And we managed to catch 5 different species total (pickerel, bluegill, perch, largemouth, and northern pike). Here’s some footage from that day of me talking about this bait and how I was using it. I can’t wait to get back out and try it again. You’ll really like the action of it if you try it. 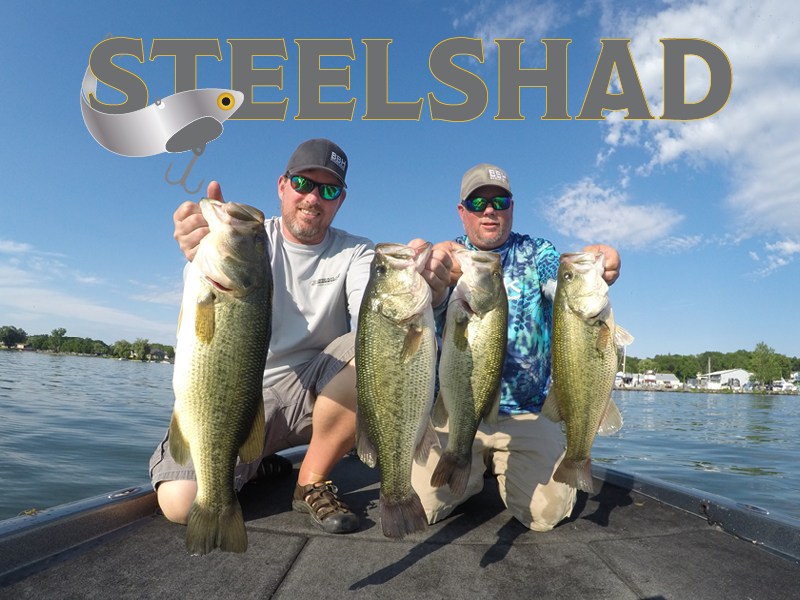 If you try it for just one day I think SteelShad will redefine the image in your mind of what you think a blade bait is and how you’re supposed to use it.